Moving over to piping, information covers piping material selection and designing and construction of plant piping systems, with attention paid to flexibility analysis on piping stress, a must-have component for both refineries with piping and pipeline systems. 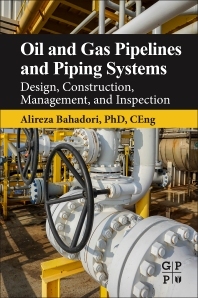 Heavily illustrated and practical for engineers and managers in oil and gas today, the book supplies the oil and gas industry with a must-have reference for safe and effective pipeline and piping operations. Alireza Bahadori, PhD, CEng, MIChemE, CPEng, MIEAust, RPEQ, NER is a research staff member in the School of Environment, Science and Engineering at Southern Cross University, Lismore, NSW, Australia, and managing director and CEO of Australian Oil and Gas Services, Pty. Ltd. He received his PhD from Curtin University, Perth, Western Australia. During the past twenty years, Dr. Bahadori has held various process and petroleum engineering positions and was involved in many large-scale oil and gas projects. His multiple books have been published by multiple major publishers, including Elsevier. He is Chartered Engineer (CEng) and Chartered Member of Institution of Chemical Engineers, London, UK (MIChemE). Chartered Professional Engineer (CPEng) and Chartered Member of Institution of Engineers Australia, Registered Professional Engineer of Queensland (RPEQ), Registered Chartered Engineer of Engineering Council of United Kingdom and Engineers Australia's National Engineering Register (NER).